Hell, as Jean Paul Sartre so neatly observed, is other people's racket. If you spend a lot of time on public transport (plane, train, omnibus) you'll find music on headphones is far more enjoyable if you're able to dial out all that pesky background furore. Bose's QuietComfort 15 headphones use a battery-powered noise reduction system, along with an ‘over-ear' design, in an effort to cancel out all extraneous background hubbub. These are relatively lightweight and winningly comfortable headphones – they'll fold quite flat when not in use and don't make your ears sweat too badly when they are. And they perform extremely well. There's absolutely as much brilliance to high frequencies as is acceptable, so anyone with a bright-sounding headphone amp, a shrill MP3 player or an aversion to a gleaming high end should audition them thoroughly, but in every other respect the QC15s are a composed and enjoyable listen. Detailed, punchy and spacious, the Bose have the low-frequency determination to cope with Squarepusher's Come On My Selector and the insight to deliver the subtleties of Lambchop's National Talk Like a Pirate Day intact. Rhythmically surefooted and dynamically adept, they have drive and attack to spare. Background noise is dismissed almost entirely, too, without the hint of white or pink noise that lesser designs can introduce. There's no discernible impact on the integration of the frequency range or the level of information delivered, either. 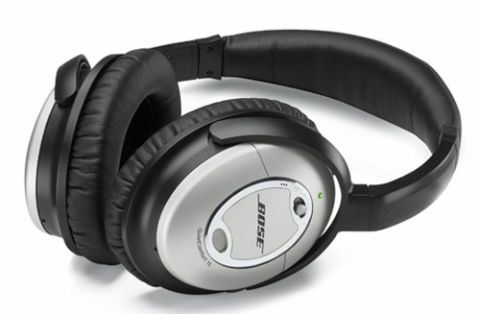 If you don't flinch at the premium price and you can handle the top-end assertiveness, these Bose are a hugely effective solution to the rest of the world's background noise.